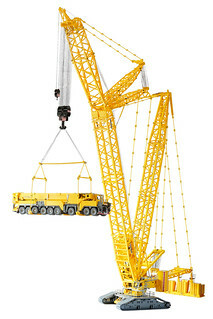 Remote controlled model of Liebherr LR 11000. 1:24 scale,~27 kg weight, 4 EV3 bricks, 9 motors, 7 light sensors, 1 touch sensor. Made 99.9% of LEGO, exceptions are PRINTED pulley wheels, stickers, strings. Slewing ring is made 100% of LEGO. I used minifig heads as rollers. I do not have instruction.